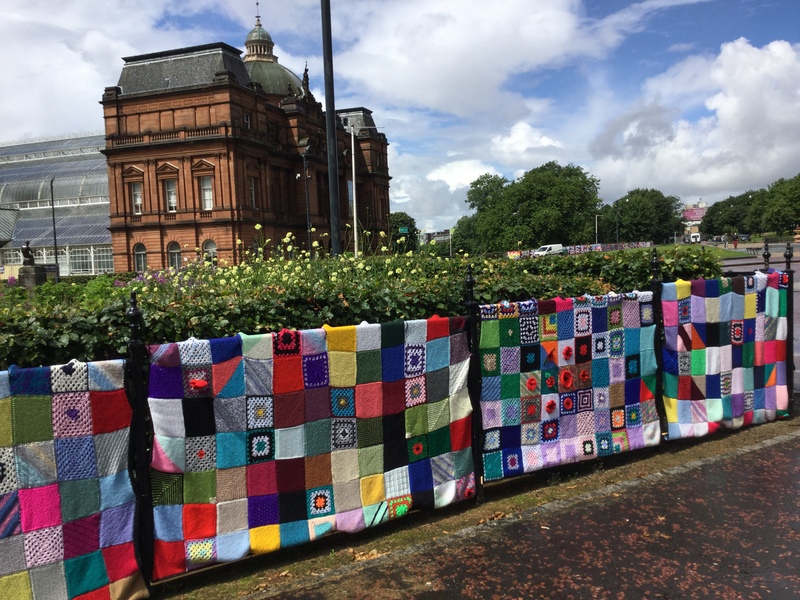 The railings on either side of Glasgow’s People’s Palace are festooned with colourful blankets at the moment. During the First World War, Queen Mary’s Appeal for Knitters exhorted the women of Britain to produce 300,000 pairs of socks and 300,000 woollen belts for soldiers, a target which they exceeded. This inspired current members of Glasgow Knit and Stitch to form SOCK – Somme Observed Community Knitting – as an appropriate way to commemorate both the soldiers of Glasgow’s three Pals Regiments who took part in the Battle of the Somme in 1916 and the women at home who knitted for them. 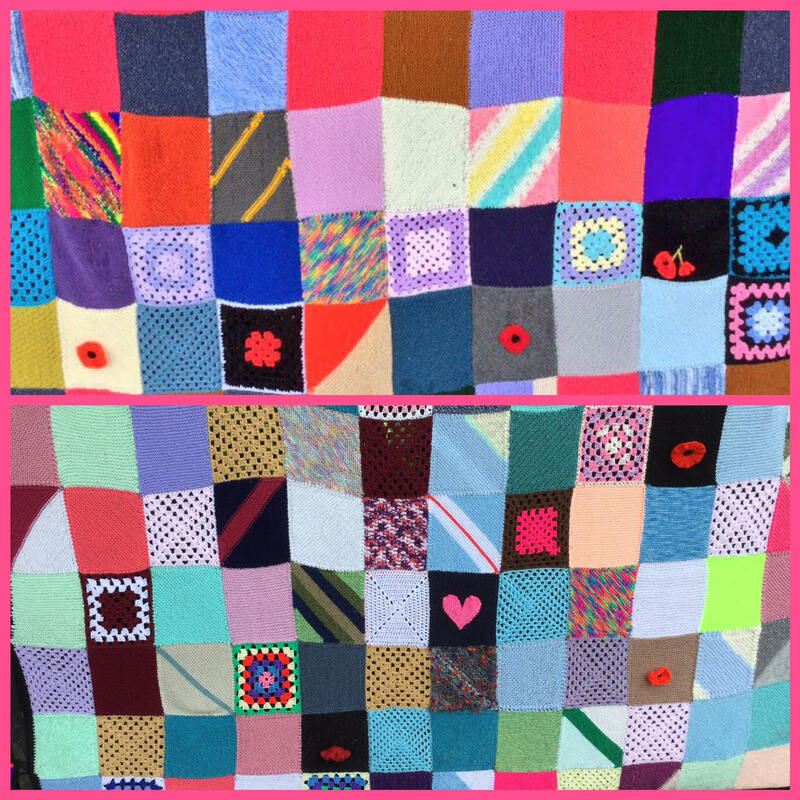 Each knitted or crocheted square represents one soldier – about 3,700 in all. Come September, the blankets will be cleaned and given to local charities working with refugees and homeless people. 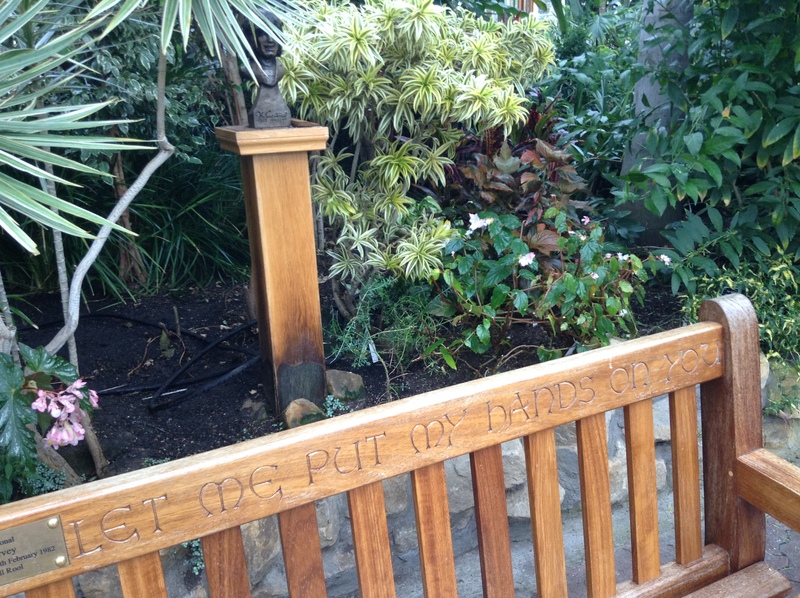 What a tremendous idea – a memorial with a practical use afterwards. Thanks to Beverly McFarlane, one of the knitters, for alerting me to it. 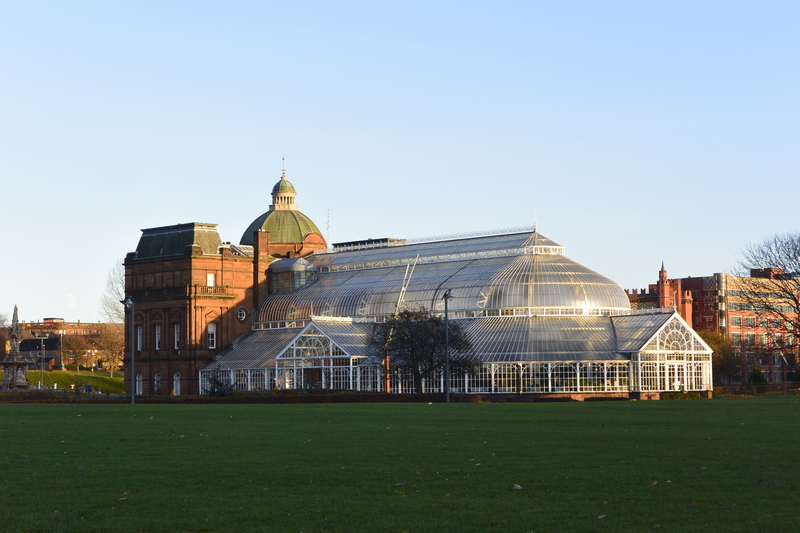 Glasgow Green is our oldest park, established in the 15th century. 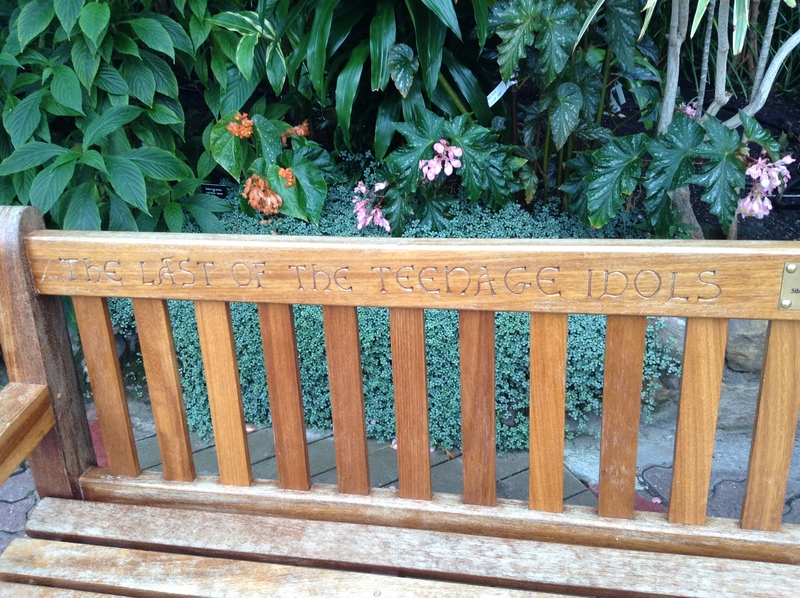 It’s also home to the People’s Palace (social history museum) with its magnificent Winter Gardens. 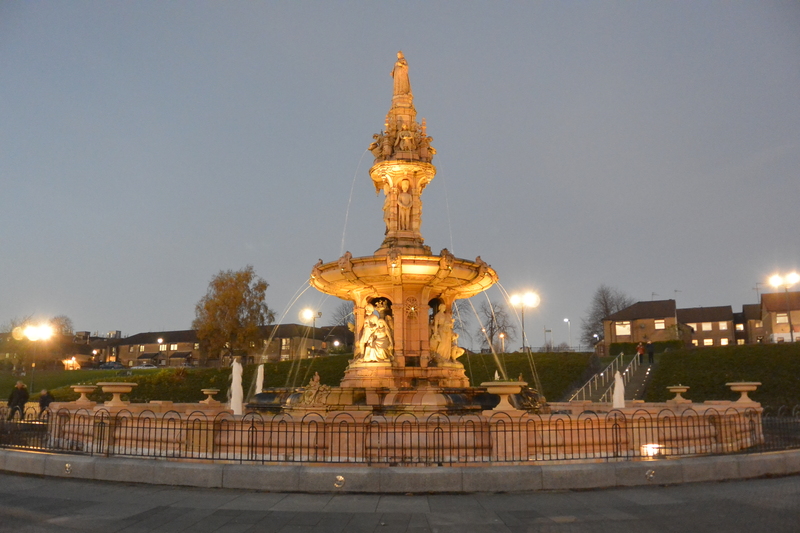 Other landmarks include the Nelson Monument (1806, thus predating Nelson’s Column in London by three decades), the William Collins Fountain commemorating a 19th century Lord Provost (Mayor) and the McLennan Arch, a remnant of Assembly Rooms which were demolished in 1890. The arch has led a peripatetic existence since, landing in its current position in 1991. On our last visit, we had a specific object in mind. The People’s Palace was hosting the five shortlisted maquettes for a proposed statue of Mary Barbour, a social activist who led the Glasgow rent strikes in 1915. These two were my favourites – read more and see the other maquettes on Adventures of a Retired Librarian. When we emerged, dusk was falling. 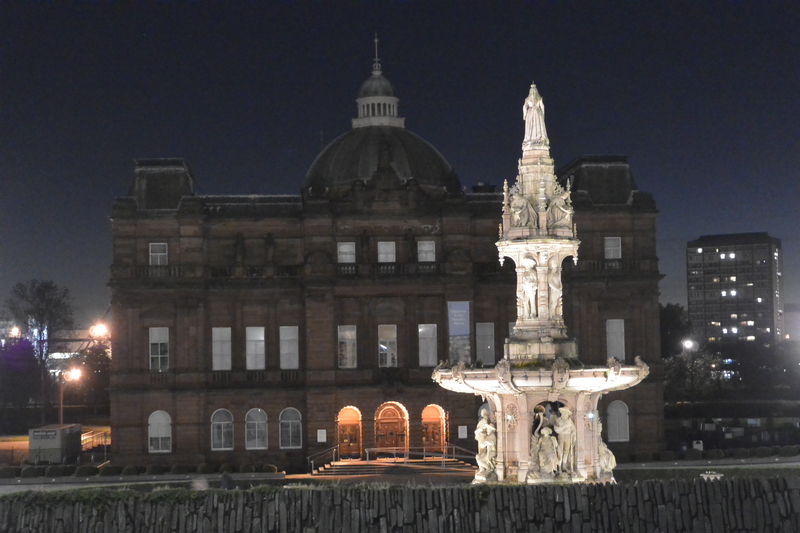 The Doulton Fountain in front of the Palace looked spectacular. By this time, we were hearing the siren voice of WEST Brewery, housed in the Templeton’s building. We didn’t resist. An hour later, we re-emerged to find the Palace and fountain had taken on a ghostly appearance. Or was that just the beer? You decide! 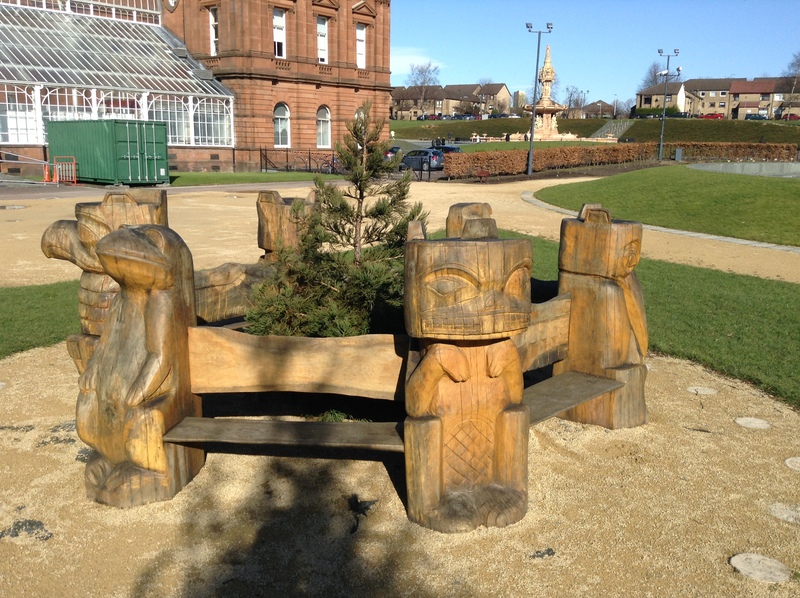 On a recent visit to Glasgow Green, I spotted this unusual wooden bench in the garden outside the People’s Palace. I don’t remember noticing it before, nor the statue of the Pied Piper (shown below with the former Templeton’s Carpet Factory in the background), but that’s probably just me being unobservant. 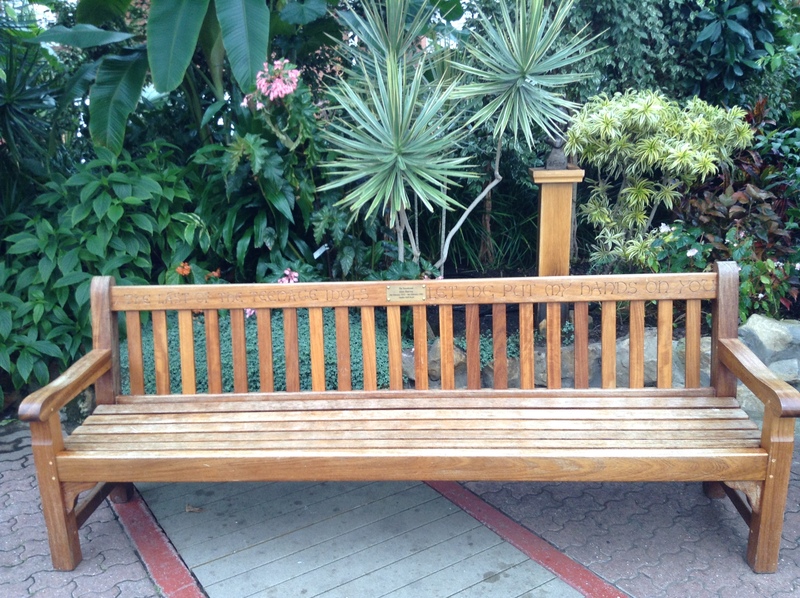 Coincidentally, I had just read that Jude at Travel Words was looking for wooden benches for her monthly Bench Series, so I thought I’d enter that for the first time. So what was I doing on Glasgow Green? I’d arrived for a rehearsal for March of Women, an adaptation of a suffragette pageant that I was taking part in to mark International Women’s Day. John McPhun, a timber merchant and East End councillor, helped to found the People’s Palace in the 1890s. His daughters inherited his sense of social justice and became suffragettes. Two of them – Margaret and Frances – were imprisoned in Holloway and subjected to force-feeding. They were featured in March of Women, played by Maggie McDonald and Teresa Cresswell respectively. Interested? There’s a full account of March of Women on my other blog, Adventures of a Retired Librarian. Doors Open Days happen throughout September in different cities in Scotland – this last weekend it was Glasgow’s event and we went exploring on Sunday, concentrating our efforts on the area near Glasgow Green between the City Centre and the East End. It was a lovely day so we wandered round the Green first – it’s home to a beautifully restored fountain, the People’s Palace and the former Templeton’s Carpet Factory (modelled on the Doge’s Palace, no less). The latter is now an office block and also houses WEST Brewery, which proved to be an excellent stop for lunch. So it was almost 2.30pm before we got going on Doors Open proper. Oh dear…. As with Templeton’s above, this building features intricate and ornate brickwork. I’d never heard of it before – this was its first outing in Doors Open – but it was originally a clay pipe factory (nothing to do with bagpipes as I thought it might be) and is now home to a group of architects, writers and artist who are turning it into studios. The group has kept the Pipe Factory name. As we left the Pipe factory, I overheard a young woman excitedly telling her friend about another Doors Open she had discovered just round the corner: an old ballroom. I though to myself “new student, not been here long” because the Barrowland is a Glasgow legend. It’s now a rock venue, and as seedy as they come: even during the day, entering the black, windowless bar felt like descending into hell! This was a rare chance to see backstage – and to discover that the stars don’t enjoy much more luxury than the punters. I think the pictures flatter it (the exterior shot at night is from a previous visit). If all this sounds as though I hate it, I don’t, I love it. Our next date with Barrowland is next month (Nick Cave). The Barony, formerly a church, completed in 1890, is now the ceremonial hall of the University of Strathclyde. Despite having worked for the University for 20 years I had never been in, so this filled a gap in my education. By this time, everything was starting to close so we wended our way home to rest our weary feet.